A food post? By me? Surely some mistake? 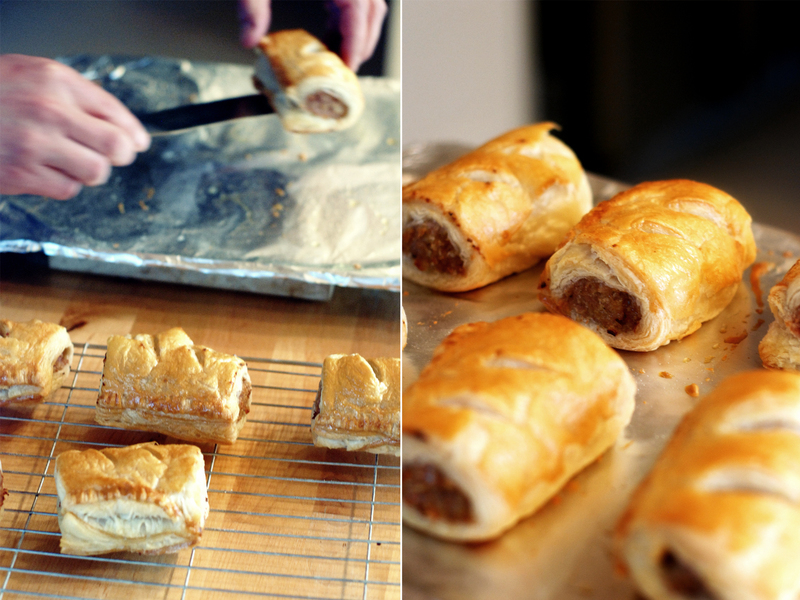 It’s all true, I did indeed make the sausage rolls in the pictures. They were the product of a happy accident that grew out of the usual christmas fridge surplus, coupled with me having time on my hands. Add to that my closet weakness for savoury pastries and it quickly becomes clear that this was meant to be. I used Jerry Howarth’s finest sausage meat, which I mixed with a slow fried finely diced onion – this gives the meat a pleasantly sweet note. At least I thought it was pleasant, George on the other hand was not so keen. I used a ready made puff pastry, which I rolled out and everything. A speedy bit of folding and rolling and the pastries were ready to be cut to length, slashed on the top and brushed with beaten egg. I cooked them for a while in the oven, 20 minutes I think at 180 or something like that. I take a strange pride in having made something that looks like it came from Greggs, with hindsight I should have eaten them out of a paper bag, now that would have really satisfied the demons. Tune in next Christmas for more bake along with Ed. Look yummy Ed….am now waiting with bated breath for furniture making with Claire :o) ! anything with pork is a plus….unfortunately. How did you have “time'” on your hands with all that lovely furniture making you do? Yummy. Think I may have to pop to Greggs at lunch time for a naughty treat, although yours look more tasty than theirs. These sausage rolls look amazing. I have no clue why they remind me of pigs in a blanket (which is definitely not an insult) but I am getting more hungry looking at this post lol. Nice.